Please note that the content of this book primarily consists of articles available from Wikipedia or other free sources online. 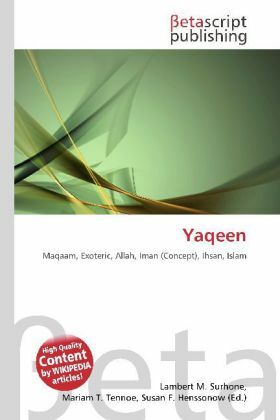 Yaqeen is generally translated as "certainty", and is considered the summit of the many stations by which the path of walaya (sometimes translated as Sainthood) is fully completed. This is the repository of liberating experience in Islam. In relation to the exoteric religious life Certainty is the sister of religious life in its perfection (ehsân), that is to say the adoration of Allah according to the visionary way; through this channel it is the pillar of Islam in the accomplishment of its external practices, as it is the foundation of faith (iman) in its internal dogma. It is in fact ihsân which gives the external religion its true meaning and the domain of faith its real values. Certainty (al-yaqîn), comprises three degrees.